1. Make sure you have a large and uncrowded surface to work on. 2. Dump your sticky rice into a large bowl (wooden, if you have it) and cover with a damp cloth to hold in the moisture. 3. 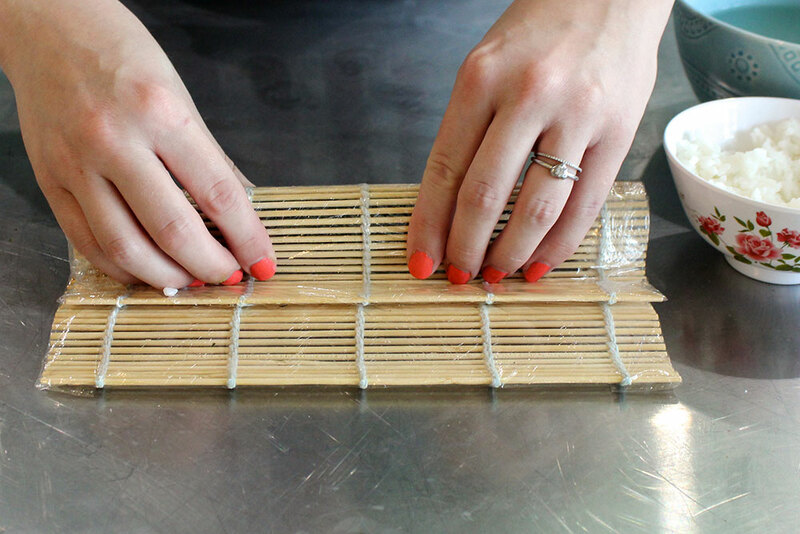 Lay a large sheet of plastic wrap onto your surface and place bamboo rolling mat in the center. Fold the two longer top and bottom pieces toward the center and seal them over one another. Fold in and smooth down the shorter edges until the mat is completely covered and sealed tight. Flip the mat over so the uncreased side faces up. 4. 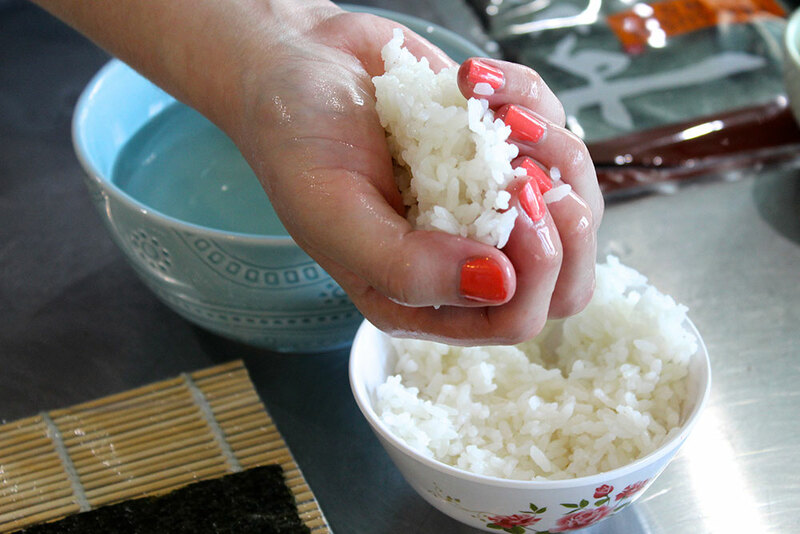 Add a little bit of vinegar to a small bowl and fill with water (this is to dip your fingers in as you go so the rice won’t stick to your hands). 5. Slice your raw salmon into thin strips, or pull apart your smoked salmon into thin strips (should flake easily) and set aside. 6. Slice cream cheese into thin strips. Cut open the avocado and slice into thin strips. 7. 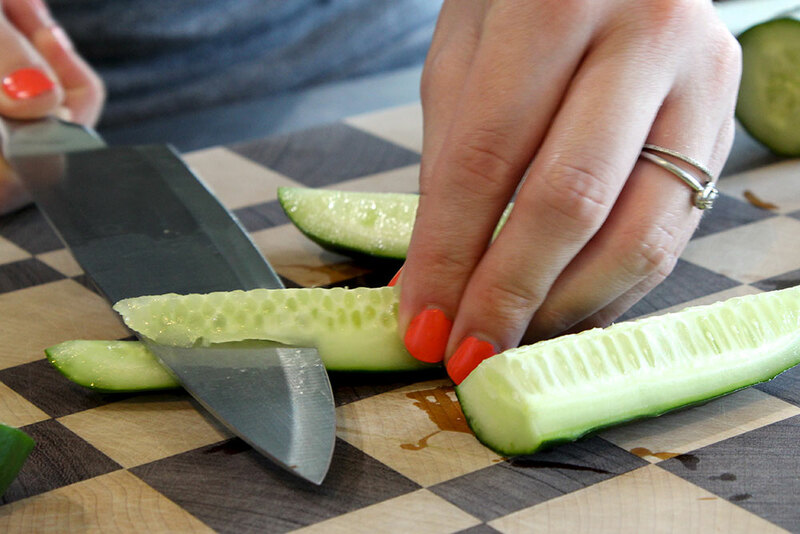 Cut cucumber into two equal halves (not lengthwise), and then slice one of the halves in half. Slice the two resulting halves both in half again. Slice out the seeds with knife (see picture). Cut smaller halves into three strips, and bigger halves into four strips. This roll typically includes salmon, cream cheese, and cucumber (but we used avocado in ours by mistake. Hey, we’re learning too). 1. 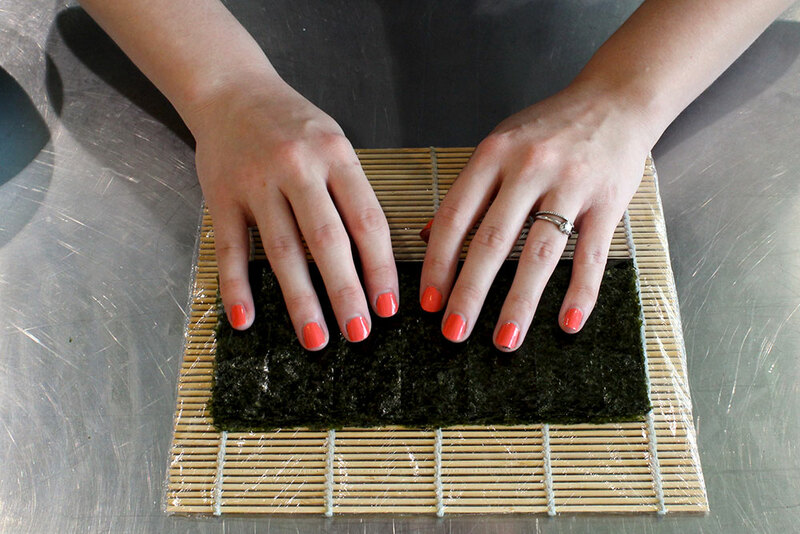 Take a sheet of Nori and fold it in half, pressing down the crease. 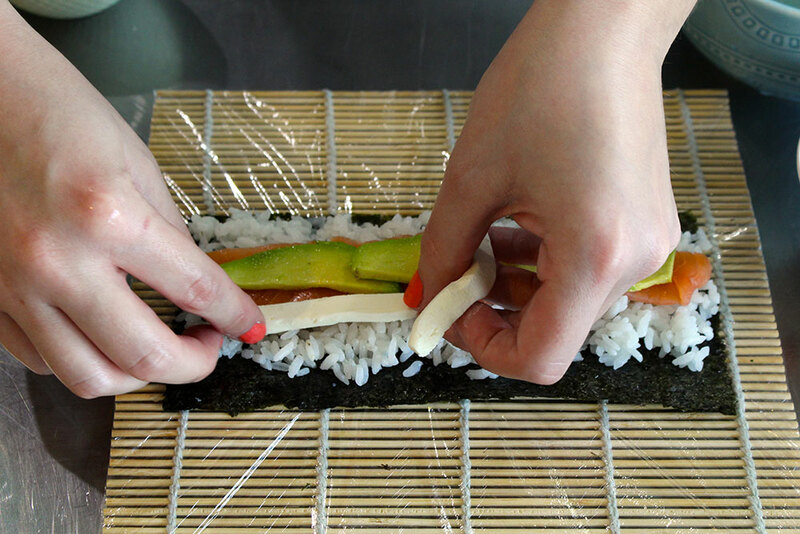 Gently tear your Nori into two equal halves and lay one aside. Lay the other onto the bamboo mat, rough side facing up. 2. Dip your fingers into the water/vinegar bowl and pick up a handful of rice. 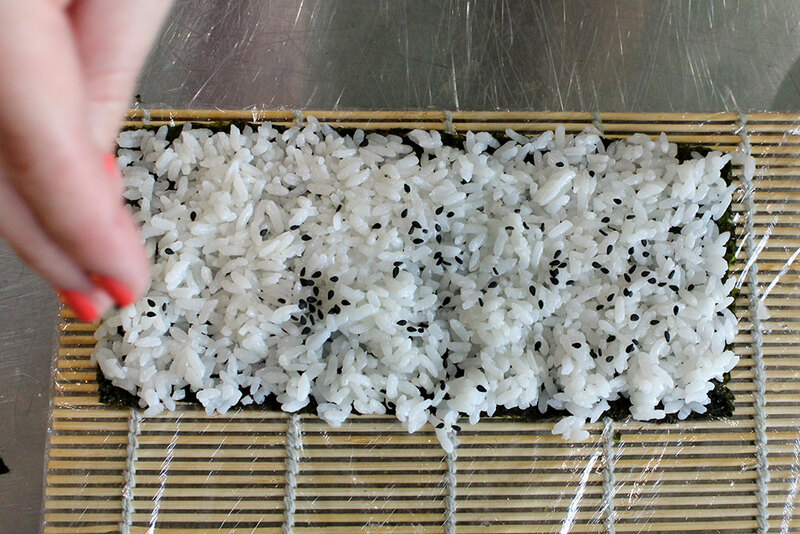 Gently roll a thin layer of rice (do not press and pack down; keep the texture light and airy) across the whole surface of the Nori, leaving a blank strip at the front. 3. 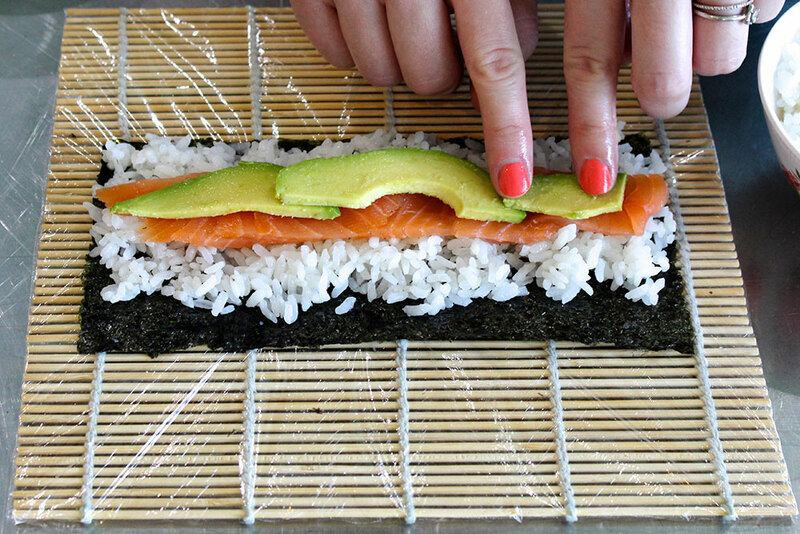 Lay thin strips of salmon across the rice, then cucumber strips (or avocado in our case) across the salmon. 4. Place strips of cream cheese flush against the salmon. 5. (This is where it starts to get really tricky; YouTube videos are extremely helpful at this point.) 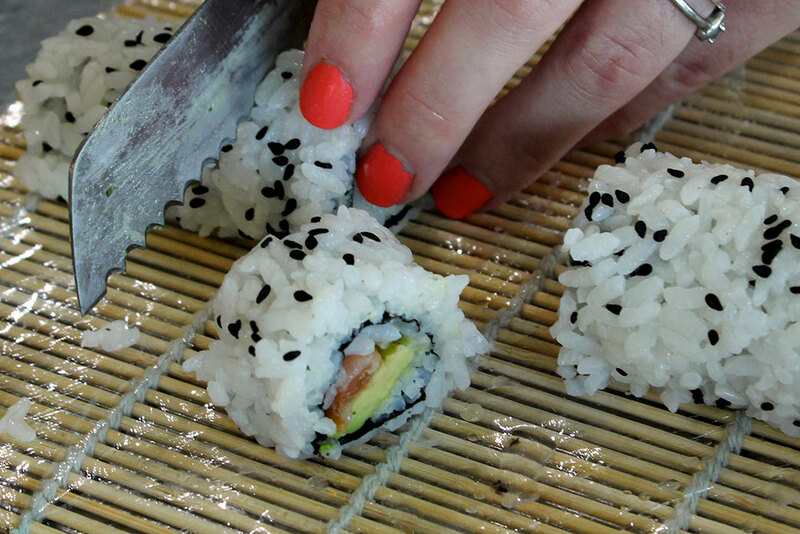 Slide the bamboo mat under your thumbs and start to gently roll bamboo mat over the sushi, keeping the insides in place with your fingers. 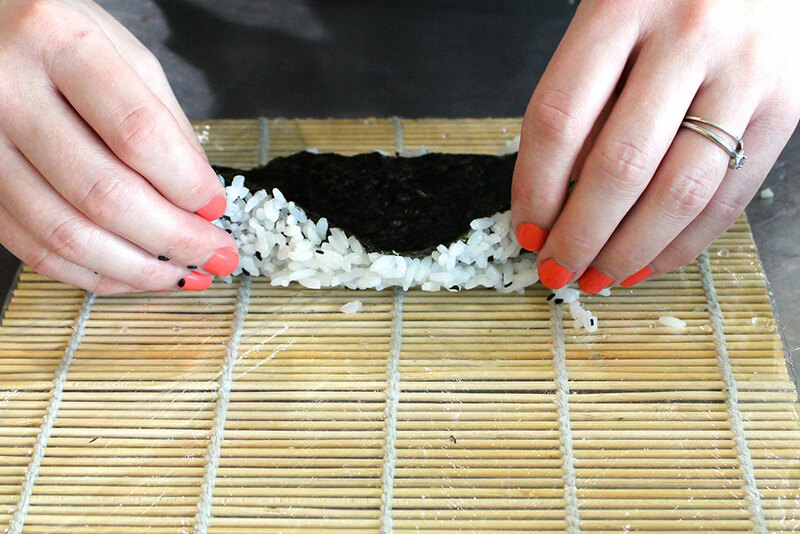 The object is to seal up the edges of the Nori without the insides squeezing out. Once the bamboo mat is folded over the roll, gently squeeze and form the roll beneath your hands. 6. 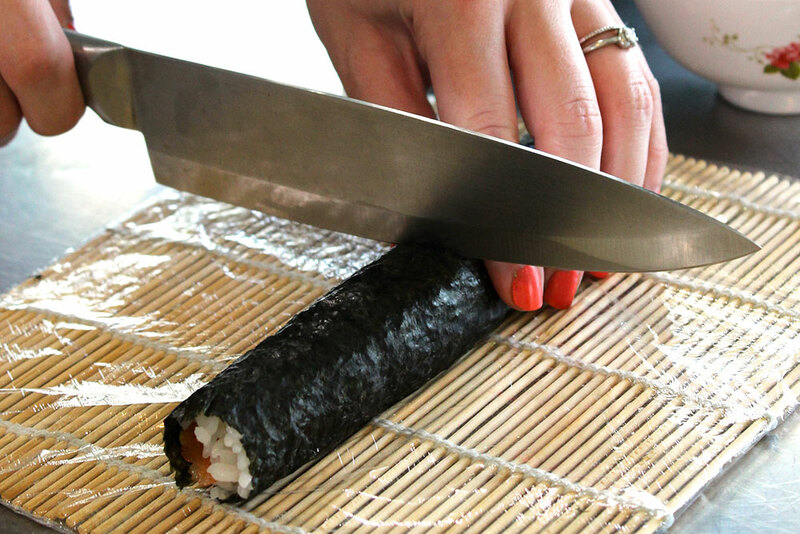 Using your sharp knife, begin in the middle and cut sushi into rolls (if the knife isn’t sharp enough it will mangle and mess up the roll). Cali rolls are made with crab or imitation crabmeat, cucumber, and avocado. All steps are essentially the same as the Philly roll except that Cali rolls are made “inside-out,” meaning the rice goes on the outside (except we also put some on the inside too. Oops). 1. 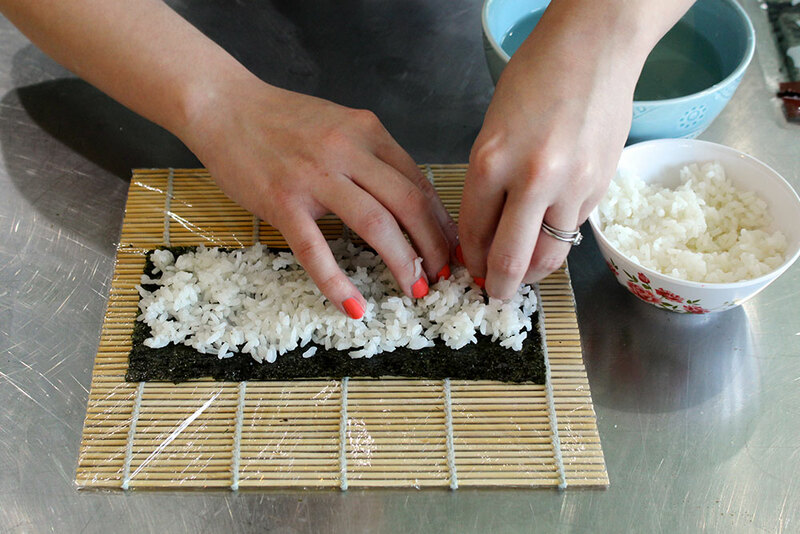 Cover the rough side of the Nori in a thin layer of rice, add a sprinkling of sesame seeds. 2. 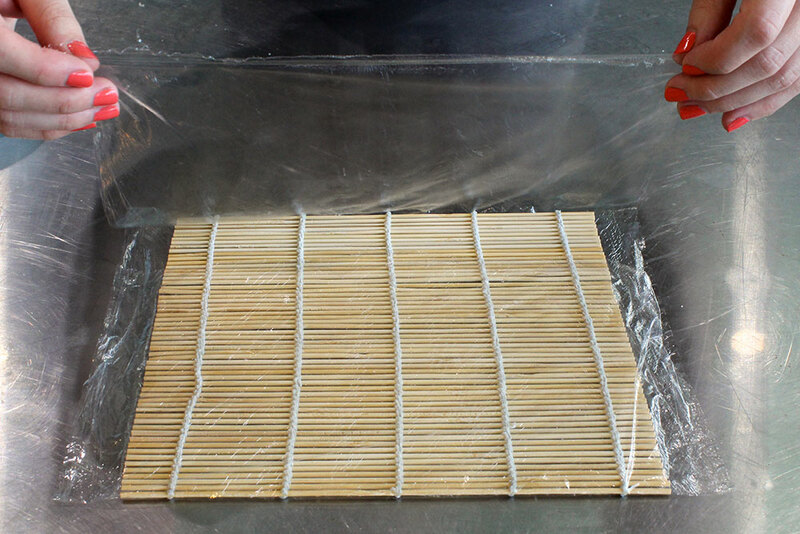 Flip over onto the bamboo mat (it will not stick to the plastic). 3. 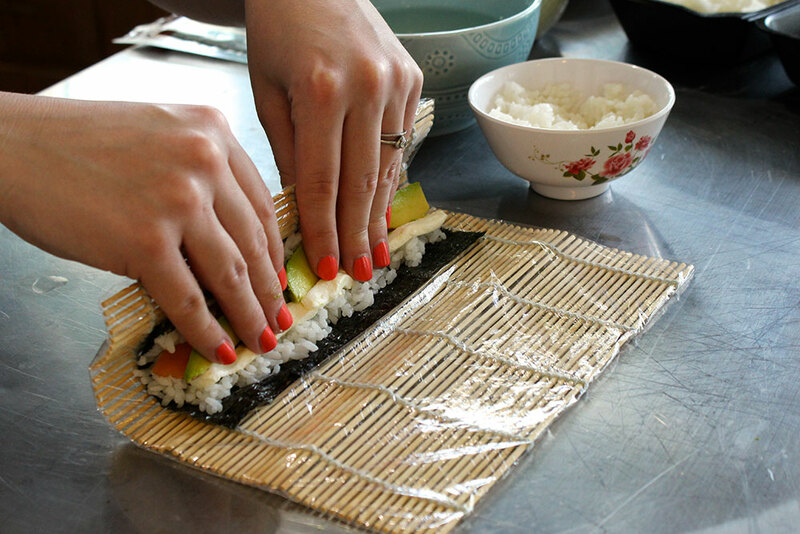 Add crab, cucumber, and avocado directly onto the Nori and then roll. Drizzle with spicy mayo if desired.